HENLEY HAWKS hosted National 1 opposition Ampthill for their opening pre-season test in perfect conditions at Dry Leas last Saturday. The visitors will be satisfied with their convincing result but the new look Hawks will have gained a lot of confidence and be disappointed that their impressive first half performance could not be sustained as Ampthill turned up the heat and pace of the game in the final 30 minutes to stretch comfortably ahead. Territory and possession changed hands a number of times in the opening 10 minutes with the Hawks pressing an early advantage and then Ampthill showing how dangerous they were in transition to attack, returning 50 metres and forcing a line-out seven metres from the Hawks line. Marcus Lowe gathered the line-out at the tail comfortably but Henley were stripped of the ball as they peeled off and within two phases from the turnover, Ampthill’s scrum half darted over for the opener which was converted. From the restart Henley pressed for the equaliser and on entering the Ampthill 22 their shorter pick and go approach kept the visiting defence on their heels as Tom Emery carried around the corner. Joe Butler was provided with an opportunity to put centre Connor Morrison through a hole in the visitors’ defence to bring them level following Butler’s conversion. Sam Lunnon and Ross Parkin both looked to be impressive additions to the Henley pack adding to the potency of the pack at the set-piece and orchestrating some impressive phase play throughout the first half. On 22 minutes the Henley number eight Alex Bradley, who had been proving a real handful for Ampthill to deal with, was taken off as a precaution with a knee injury and replaced by Liam Goodison who had impressed for the Bulls earlier in the day. The Hawks let an attacking line-out opportunity slip by but continued throughout the first half to make life difficult for Ampthill’s big ball carriers to make a dent. A missed penalty on half-time would have given the Hawks a narrow lead but Butler’s effort was off target from the tee. It wasn’t until 11 minutes into the second half when Ampthill stretched ahead as they turned over ball at a ruck and set a cleverly worked rolling maul where the ball was palmed off deftly to their lively scrum-half who again dashed over the line. The Hawks restart was too long and the resulting halfway scrum allowed Ampthill to show their dominance in this facet of the game through their experienced pack. Their pace became apparent as they worked two tries in quick succession from set-piece possession to score on both flanks in quick succession. Lowe and wing Jack Antoniou were both forced to clear the Henley lines with some desperate but remarkable defensive play to dampen Ampthill’s quickening game. Henley forced their way upfield and almost sent Sam Randle over on the right side. Ampthill showed their ability to turn defence into attack breaking out 60 metres from a five- metre defensive scrum and despite a mighty effort to stem the momentum they broke the Henley defence on the 22-metre line and although the final pass was fumbled the blind-side flanker dribbled the loose ball over the line and dropped on it to score. Ampthill’s kickers added the two extra points from a tight angle to make it 33-7. Ampthill’s blind-side flanker scored a second try which was returned almost 60 metres through an exhausted Henley defence following the restart. 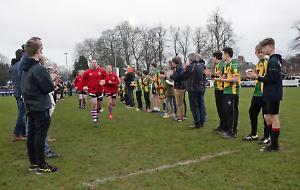 Henley Hawks: Ian Stock, Tom Emery, Rory Mason, Ross Parkin, David Hyde, Sam Lunnon, Marcus Lowe, Alex Bradley, Archie Hancock, Joe Butler, George Wood, Connor Morrison, Xavier Andre, Sam Portland, Sam Randle. Replacements all used: Simon Brown, Andrew Stobbs, Andrew Grant, Adam Neal, Liam Goodison, Scott White, Silas Pill, Leo Webb, Jed Whitehouse, Liam O’Neill, Ryan O’Neill, Jack Antoniou, George Primett. HENLEY BULLS kicked off their pre-season against a strong Ampthill 1881 side at Dry Leas last Saturday. Henley started brightly and were on the front foot, looking after possession and going through the phases well. Leo Webb, the young scrum half, was mixing up the play bringing the forwards and backs into the game which led to a penalty which Henley put wide of the posts. This allowed Ampthill to get their hands on the ball where they met a stern defence, with Henley putting in some strong tackles, led by Andrew Grant, Simon Perry and Scott White. The pressure told and Henley conceded a couple of tries before the home side lost Will Janes to a broken hand. With Ampthill gaining more confidence and applying the pressure, the Henley defence stood strong and a couple of good turnovers from Silas Pill allowed Roddy Giles to relieve the pressure. The second half started with Ampthill in possession again but as in the first half Henley’s defence was worked hard, defending well with players putting their bodies on the line. However, gaps were starting to develop which allowed Ampthill to clinically win a few more scores. Henley kept going and were close to going the whole length of the field with backs and forwards linking well to set Sam Quelch free. Henley kept going right down to the last whistle and gained their reward with a well-worked try finished by Pill.